Raj and the BEST DAY EVER! tells the heartwarming story of the day that a little tiger, Raj, spends with his dad. When my daughter was younger she always gave her dad a picture book for Fathers’ Day and this story would make the perfect Fathers’ Day present. The Story: Raj and Dad make a list of everything they would like to do on their day out together but as they leave the library Dad discovers he has forgotten his wallet. Their plans change but Raj and Dad discover that they can have fun together without spending any money. Raj and the BEST DAY EVER! celebrates the power of imagination and shows the pleasure and entertainment that children can create in familiar surroundings. Raj and Dad can’t go to the city farm, the gallery or the cafe but they come up with some fabulous alternatives to their list. They ‘ride a tractor’, create their own art and make boats to sail down the river. We love the way that all of the activities they undertake require only natural items and and imagination. In an age where screens play a large part in many childhoods this is a wonderful story to encourage a child to go out and observe and experience the world around them. The strong bond between Raj and Dad is beautifully shown in everything they do and say and during the story they support and comfort each other as well as having fun. Their day starts with a long walk during which Dad encourages Raj to look at everything going on around them. 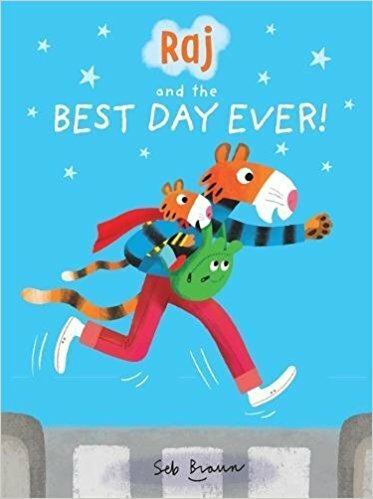 Dad’s acceptance of Raj as a superhero, a trip to the library and the inclusion of so many parents and children enjoying being outside all add to the appeal of this lovely story. 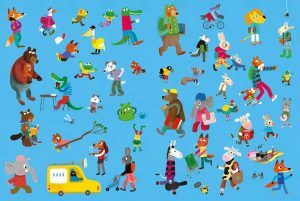 We absolutely love Seb Braun’s illustrations which are colourful, wonderfully busy and include many different animals working and engaging in their daily activities. My daughter likes the picture that Dad and Raj make in the park, it’s such a simple and fun activity that children can do using natural items. 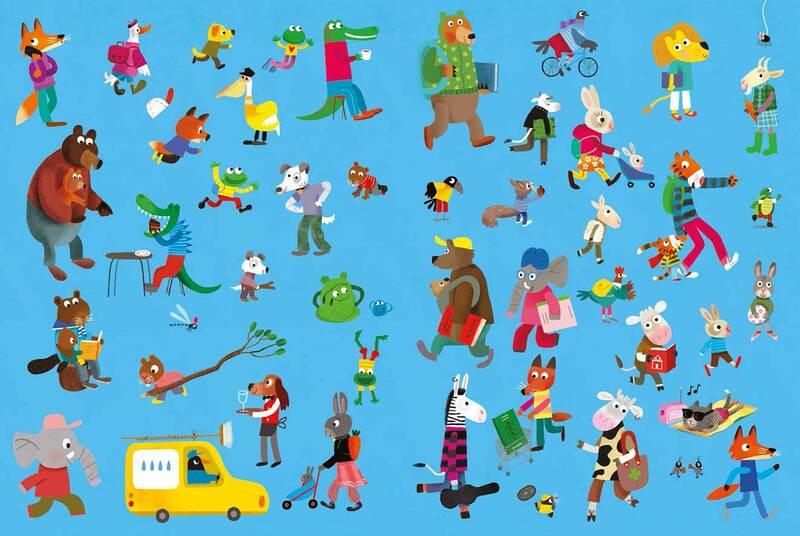 I love the double spread showing the walk to the library, there is so much activity to talk about and it reminds me of the Richard Scarry spreads that I pored over as a child. The endpapers are particularly fabulous and you can see more of Seb’s illustrations here. Raj and the BEST DAY EVER! is a lovely celebration of a father / son relationship. The story, narrated by Raj, is wonderfully child centred and the details in the pictures can encourage lots of discussion about what characters are doing. The endpapers could be used to stimulate a game of ‘I Spy’ which will help to develop observational skills, colour recognition and counting. Thank you Templar Publishing for sending Raj and the BEST DAY EVER! We’d love to see another story about Raj and Dad. It’s lovely isn’t it. Seb Braun’s illustrations are fabulous! You have described the book perfectly Kate. I have so many wonderful childhood memories of activities that didn’t cost anything and that is the message that this book conveys. This does sound lovely. A strong bond between a father and son, plus reminding kids they don’t need money or technology to entertain themselves sounds like a story every child should read! It is, it’s a gorgeous portrayal of a father / son relationship.